The CN8590 is a 1/32 DIN microprocessor based controller that provides accurate closed-loop control of temperature and other process variables. With on-demand auto-tuning, and complete On/Off through full PID functionality, the CN8590 accepts inputs from K, J and T type thermocouples, RTD's or linear signals. Standard features include a large easy-to-read LED display, dual outputs, field selectable inputs, process or deviation high/low alarms, and bumpless auto/manual transfer. On/Off output hysteresis is adjustable and the unit may be easily configured in the field to display process value, deviation or output percentage. 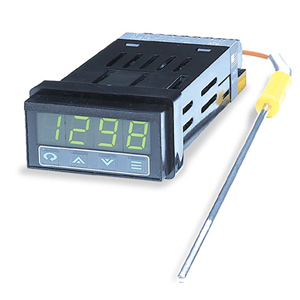 Display Resolution Selectable: 0.1, 0.01 for process inputs, 1.0 for thermocouple inputs, 0.1, 1.0 for RTD inputs. RTD: Platinum 100 ohm at 0 Degrees C, DIN curve 0.00385. SSR: Solid-State Relay, 120/240 Vac, zero Voltage switched 1 Amp continuous 10 Amp surge @ 25°C. * Note for mA Input, connect external 2.5 ohm resistor across signal input terminals.